Yesterday I had one of those breathless days, seeking oxygen to keep climbing up the mountain of business success. So this morning, I woke with that feeling of minor exhaustion, I could tell yesterday was one of those big climbs. Today, I have restocked my oxygen tanks and I can visualise the summit. My thought for today is about our own personal mountains. The one YOU are climbing; the size of the mountain you have chosen, the sherpa’s that help you get there, the lack of oxygen as you climb the last part to reach the summit; the clouds that spread across that make it hard to see the top. The energy you need to keep on climbing. And finally, the fact that maybe you hadn’t even set out to climb the mountain you are now on, do you go back, re-establish your plans, keep going? Does this make you catch your breath? 3. How to manage the thin air, the moments when we literally cannot breath, how to manage the stress and exhaustion, expect it, embrace it, solve it and move onwards despite it. 4. Manage the clouds that descend around us, these clouds come in the shape of negative people, fear of our own ability, external happenings that we cannot control, the day to day issues that seek to hide the vision we started off with. 5. And the big one, the fact that this mountain you are now on, did you actually visualize it in the first place. Is it far bigger than you imagined, have you ever seen the top and been able to imagine the view once you get there? I know my mountain – it is HUGE, the mountain is still the same one I started to climb in 1998. It is a very tough one, has had loads of crevasses’, some small summits, but just as I reached that summit, I had to walk down in order to climb a bigger mountain, I forgot to find some sherpa’s along the way, I tried to do it without any oxygen tanks, I got taken off the mountain and placed in a tent to rest for months, years. I lost confidence, I thought I could never do it, the mountain didn’t move, it was constantly in my sights. I am back on the largest one, and I feel strong enough now. My mountain is to “Connect Business Hearts”. My sherpa’s are you, my oxygen is the strong mind I have to keep on having, my clouds are the people who can’t see what I see, the people staying in the old world, they are also people who take my oxygen and don’t replace it, the drains. But the summit, oh my goodness, I can see it, I can see the view, it is worth the falls, the exhaustion and the constant climb. So, today, can you map your mountain? Can you see it? Feel where you are, imagine the view from the top. What are the people and skills you need to get there? 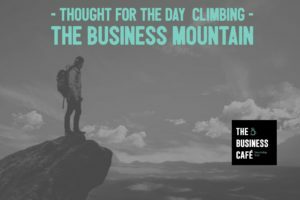 I wish you a great climb today, with sun on your back, plenty of oxygen and loads of sherpa’s holding your hand, carrying some of your load and telling you… “you can do it”.